Get ready, Pacifica, for some ’90s ROCK as Flannel and Corduroy return to Longboard! Jump around to the thermal sounds of Nirvana, Smashing Pumpkins, Green Day, Stone Temple Pilots, Alanis Morissette, Alice in Chains, Weezer, Rage Against the Machine, No Doubt, 311, Foo Fighters, Beastie Boys, 4 Non Blondes and many more with a tasty performance by the Bay Area’s Premiere ’90s Alternative Rock & Grunge Tribute, FLANNEL! 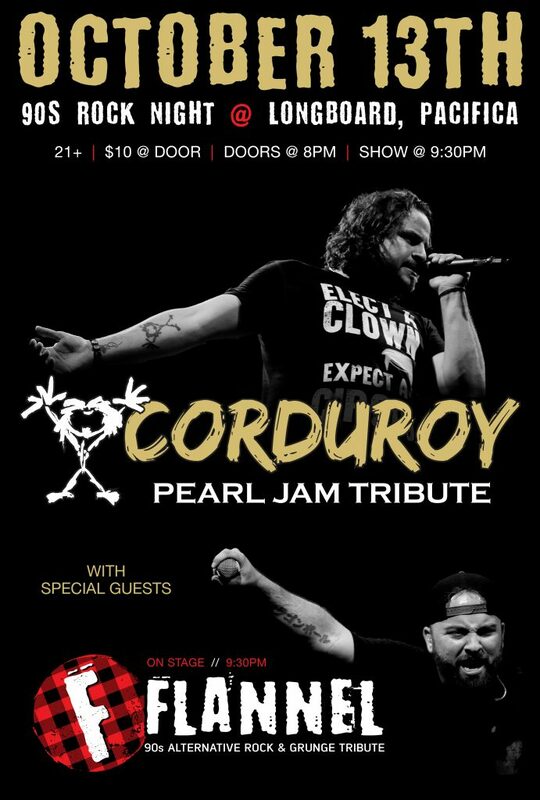 Then stick around for an amazing performance from our friends, Corduroy: Pearl Jam Tribute!